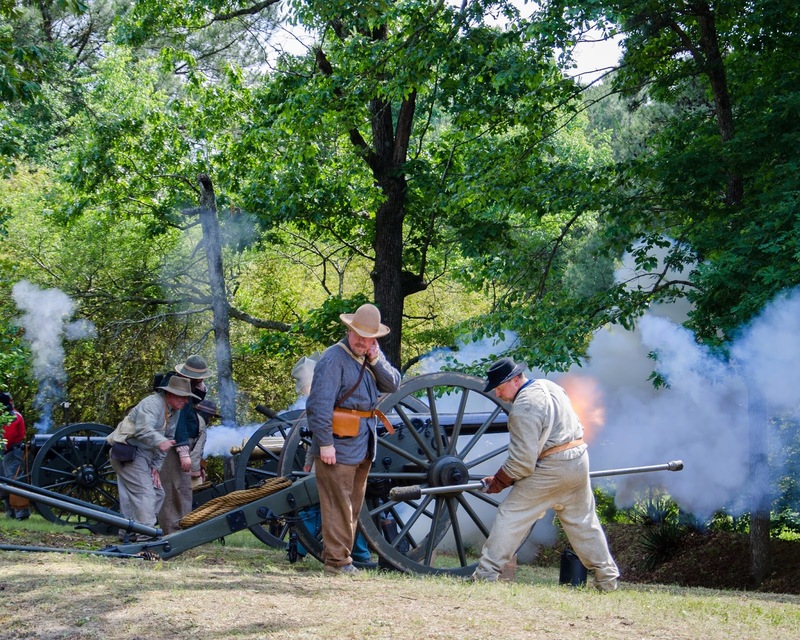 For the documentary that I have been working on, I have had the chance to photograph cannons being fired at different Civil War Reenactments around Georgia. It started out with a few shots that showed the smoke billowing out in clouds from the barrel of the cannon, but I wanted fire, lots of fire. So I did some practice and through trial and error I developed my method. Poor timing. I fired the shutter too early. 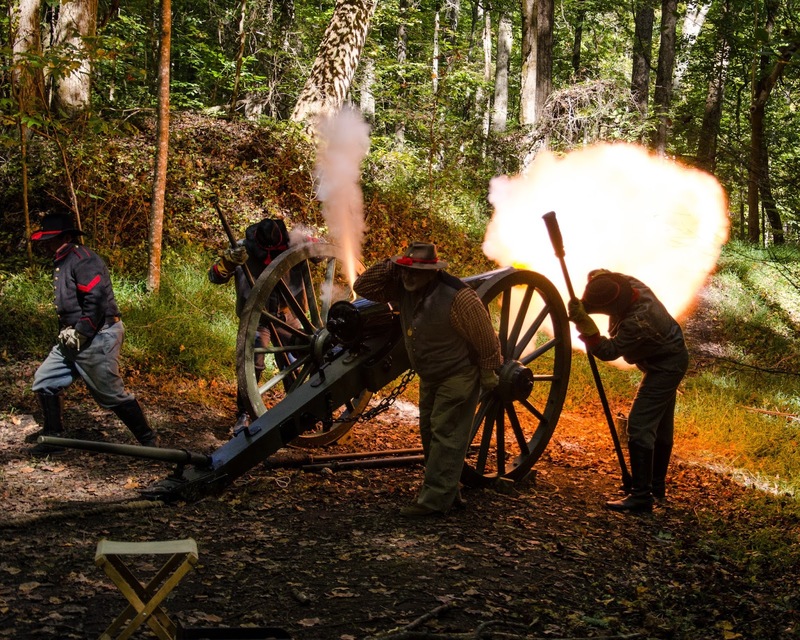 I learned that timing is everything and if you do not watch the cannon crew and learn their signals to fire, then you will miss the shot every time. 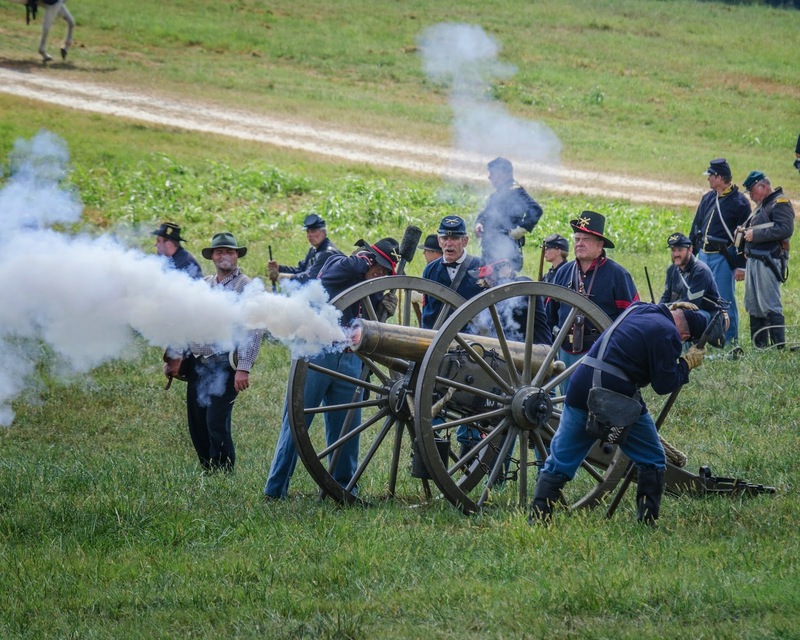 After seeing a crew fire the cannon several times you begin to get a feeling for their timing. There is also a small delay from the time the “fire” command is given until the lanyard is pulled and the primer lights and ignites the power. 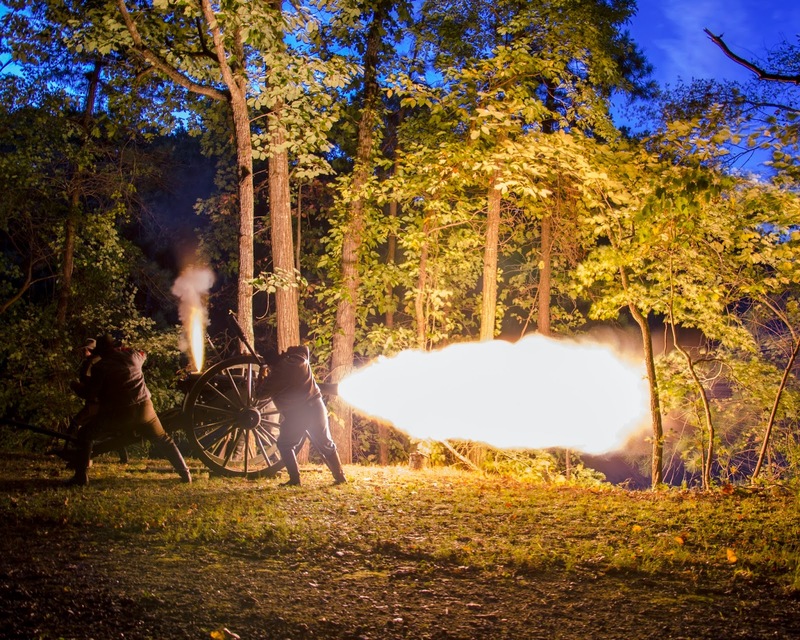 So, timing, with careful observation and a little luck are key to successfully photographing a cannon with a billowing cloud of flames. I have also learned that being as close as can helps with timing as well. Using the highest frame rate your camera allows helps with timing also. Great timing. Both cannons fire at same time and so do I. As far as exposure goes, I found that I really need to under expose in order to get the flames billowing from the barrel. How much under exposure, well it depends on the environment at the moment and ambient light. A bright sunny open field may cause me to under expose by 2 or more stops. If your in the woods on a cloudy day under a heavy canopy of leaves, you may only need 1/2 a stop to 1 stop of under exposure. I am shooting in manual mode so I have total control of the exposure. Some times I use a tripod if I have it with me, but I have made many handheld images as well. 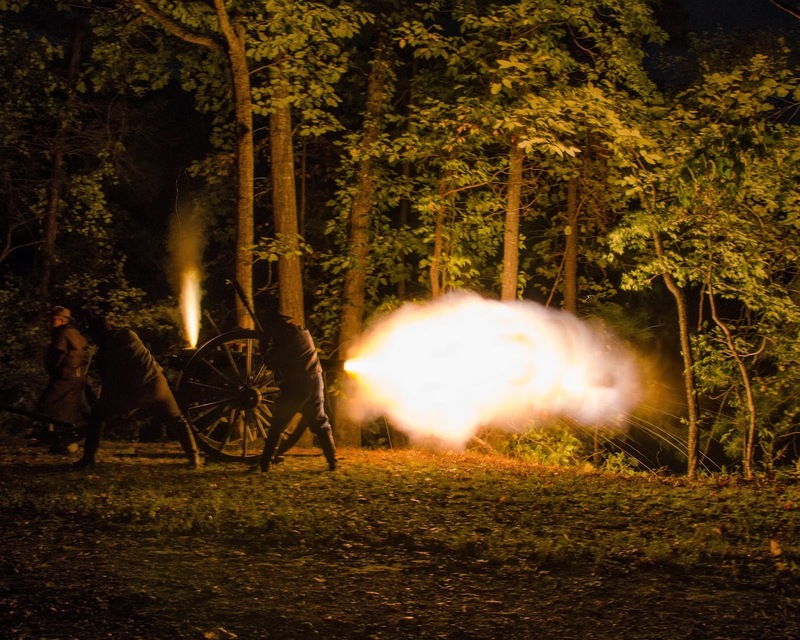 Night firing of a cannon is a really special event. The images have a totally different look and feel to them. For the night firings, I use tripod, because I am also using longer shutter speeds. I have found around 2.5 seconds is good. The ball of flames acts as a flash would and will light up the cannon crew and part of the area around the cannon. The shot to the left was under exposed by several stops from the previous one. This offers slightly more detail in the flame and you can also see some of the embers streaking out of the cloud of flames. This next shot was just under exposed by about half a stop, but when I processed the raw file in photoshop I was able to bring the exposure down by another stop and an half. This allowed for some detail in the flames and smoke. My timing was off on this image. I fired the shutter just after the fire would have shown. If you look close you can see a faint orange glow just inside the barrel where there was powder still burning. Camera placement is also very important just as it would be for any composition. 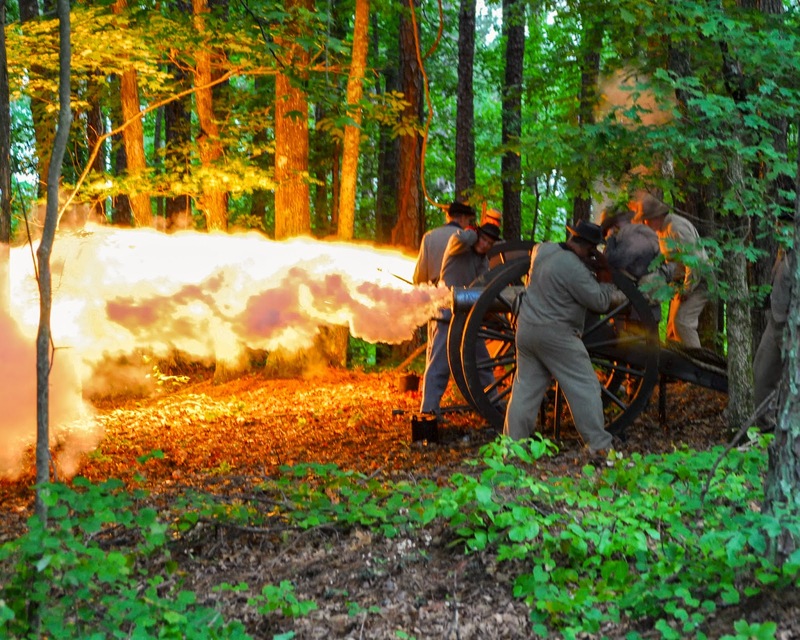 Shooting from the side of the cannon allows for shots that show the length of the flame. 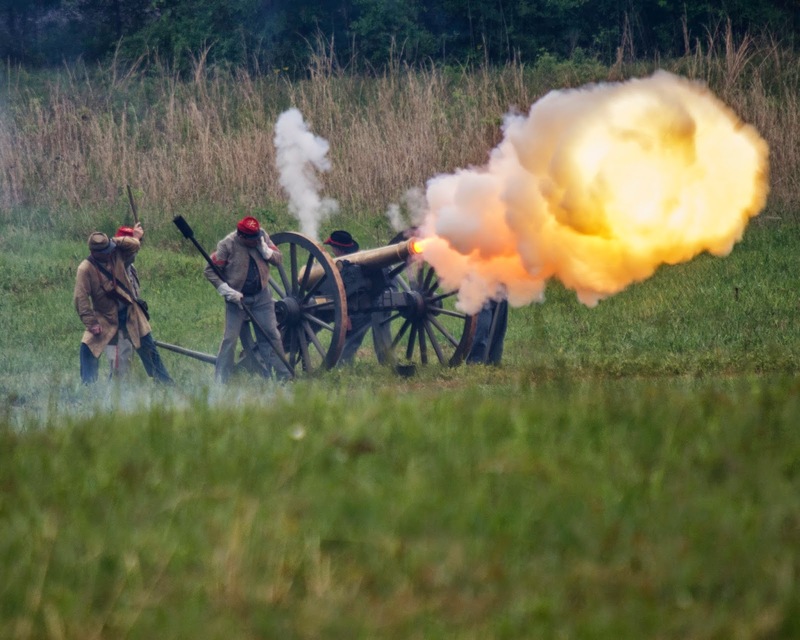 Images from the front or back of the cannon will show a ball of flames. Sometimes the ball of flame can be used to silhouette crew members. 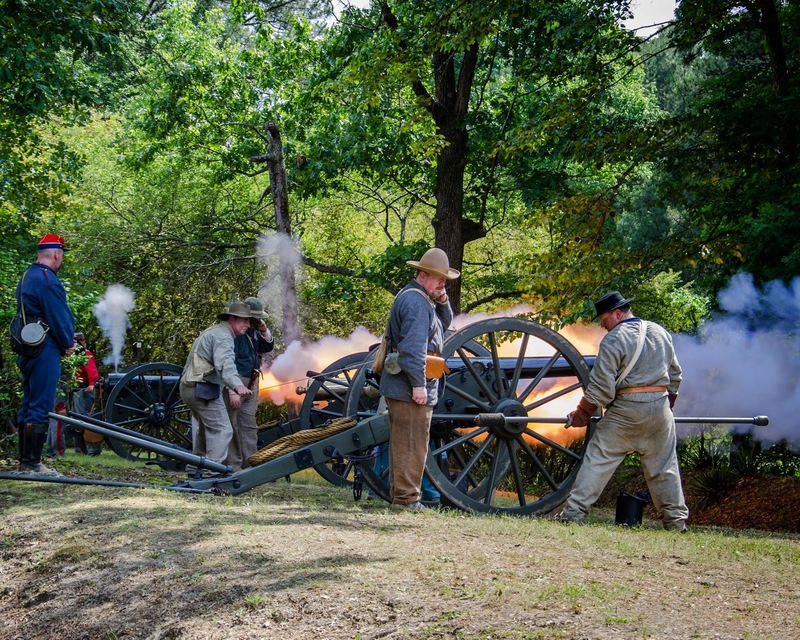 When photographing multiple cannons, look for a position that allows for a view of both cannons. The image at left displays a poor camera position and the flames from the second cannon are obscured from view by the first cannon. Many times though, you are limited to certain areas for safety reasons and the best location to make photographs from may not be the safest. Always follow the directions of the persons in charge of the event in regard to safety zones for the viewing of cannons.